Often, there are situations when one needs to do the same actions over and over again. System admins solved this repetitive tasks by scripting them. Scripting languages were however limited to the operating system or in some cases to a middleware application. New applications provide RESTful APIs that extend the power of scripting languages from the OS level to virtually every application available in the infrastructure. Using RESTful APIs one can create complex workflows that execute orchestrated actions on different applications. This brings a new word into the vocabulary: automation. Let's take a simple example - new developer is hired and needs a dedicated dev and test environment. 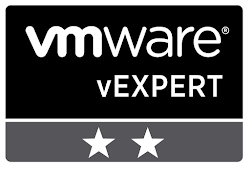 We are using VMware vSphere and NSX to provide that environment. Because we don't want to interfere with other environments, we want to isolate it. For isolating environments at network level we can use Edge Services Gateway (ESG) and dedicated VXLAN. At vSphere level we need to control resource consumption. If there is vRealize Automation or vCloud Director, these tasks can be easily automated from the GUI. What is there is no Cloud Management Portal, or the one the exists is not integrated with NSX and vSphere. Then we need to go back to scripting language. Before we begin, a few words about the environment. I am using PowerShell 6.0.1, downloaded latest stable version from GitHub. The reason for doing this is that in version prior to 6.x there are issues with getting PowerShell methods to trust self signed SSL certificates. In 6.x you can add -SkipCertificateCheck parameter to both Invoke-RestMethod and Invoke-WebRequest to accept self signed certificates. After we get the password, we need to decrypt the secure string from unmanaged memory and write it in a string variable. We use the following methods: PtrToStringAuto and SecureStringToBSTR. We encode the username and password to Base64 and create the header. Lastly we create the URI (will get existing edges) and run the query. The output will be sent to a XML file. We have the XML file with all existing edges. Let's get vnic configuration for each edge. First we load the XML file and look for edge child nodes - pagedEdgeList.edgePage.edgeSummary. For each edge we find, we use the objectId to query the API for its vnics and put that result into a file. Within the foreach loop we are creating an array ($esgObjectArray) that contains the edge id and the edge name. $esgObject object is used to get the parameters for each iteration of the loop and add them to the array. This will be used to get the IP addresses for each edge and export all in a CSV file. The variable $baseFilePath can be any destination on your local system where you want to place output files (e.g "D:\scripts\myEsgConfig\"). As you've seen, we used Invoke-RestMethod to query the API and saved the results in XML files for later use. You can use other REST methods like PUT, POST or DELETE to manage NSX environment. In the end it is all about manipulating creating and manipulating XML/JSON content to do the operations from command line .